Here’s a picture of one, so you can join me in basking in the coolness of nerves. What’d I tell you? Coolness personified. Well, maybe not personified….but if you squint closely, you may find yourself glancing at your neighbor and having a shift in perception, suddenly seeing his shape described only by a network of white, filamentous strands, as if he were a sculpture of spiderwebs…. Well, that’s okay. I also subconsciously judge people based on how easily I could start an IV in the veins on their hands. A nerve cell is called a neuron. That’s the cell in whose coolness we were basking, up there a minute ago. There are three parts to any neuron. The dendrites (from “dendron”, which means “tree”) are the tree-branch-like projections off of the central cell body, also known as the soma or perikaryon. The dendrites collect impulses from surrounding neurons and send them to the perikaryon. There are usually a lot of dendrites on a neuron, making it easier to collect a LOT of information. So, a neuron receives signals through its dendrites. But what if it wants to say something to the other nerves in the area? That’s where the third part of a neuron comes in, the axon. Axons are incredibly cool structures, too! There’s a conical process on one end of a perikaryon called the axon hillock, and that’s the staging platform that shoots off the axon, a long, cylindrical filament that keeps its diameter for practically its entire length (whereas the dendrites tend to taper off). Axons are responsible for carrying information away from the perikaryon, toward whatever it’s supposed to connect with and talk to. Wherever it is. Okay, a little more terminology, then I’m calling this post a wrap and going to bed. And then we’ll get to the REALLY incredibly cool stuff in the next couple of posts. The connection where nerves can talk to each other (or to muscles or gland cells or whatever) is called a synapse. 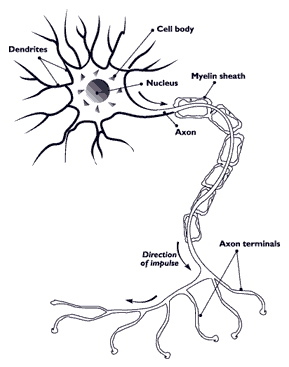 Axons can form synapses with cell bodies, dendrites, or even other axons. For clarity purposes when describing nerve connections, a neuron sending a signal toward the synapse is called “presynaptic”, and a neuron that receives the signal from the synapse is called “postsynaptic”. Synapses are oases of awesome in a desert where the sand is made of unabashed coolness. They might get their own post. Or a couple. We’ll see. Axons are covered with a nifty stretch of jointed insulation, called a myelin sheath. More about that, too. Later. I know you can’t wait. I hardly can either. But I’m pushing bedtime as it is. Man, I’m a geezer already. But that’s okay. At least you can read this at three in the morning, if you want. Because your nerves make it possible. Junqueira, Luis Carlos; Carneiro, Jose. Basic Histology: text and atlas. 11th edition. McGraw-Hill, 2005. Joss Whedon, I’m calling you out! And I thought, great, Joss Whedon…lumbar punctures the way they happen in reality aren’t scary enough? Now we have to make people think we’re going to lower them screaming onto a bed of giant horse needles? Seriously? My job isn’t hard enough? There’s not enough anti-doctor sentiment running around? Now I have to convince my overly-to-the-point-of-unnecessarily-anxious patients that, even though spinal taps are certainly no fun, they’re not actually about to be inserted into a hyper-futuristic-and-evil-looking torture device! Yes, ladies and gentlemen, it’s time to buckle up. Because what we have here is another occasion in which a writer sacrifices any semblance of medical plausibility in order to grab at false drama. And I’m going to call him out. 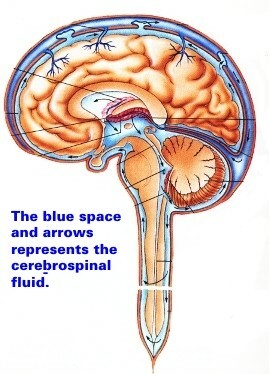 Cerebrospinal fluid (CSF) is a watery substance that surrounds the brain and the spinal cord. It is produced by the choroid plexus in the ventricles of the brain, circulates through the blue area you see below, and is absorbed into the venous circulation through structures called arachnoid villi in the skull. The function of cerebrospinal fluid is to support the metabolism of the brain while providing a cushion against mechanical injury. It’s what separates your soft brain tissue from your hard skull so you don’t bruise it every time you shake your head in despair at the medical misinformation you’re seeing on the TV screen. (And it’s apparently a repository for imprint-immunity. ::shrug::) PS: That part I could suspend my disbelief for. It wasn’t great medicine, but the hand-waving was perfectly adequate for what they were trying to do, in my opinion. 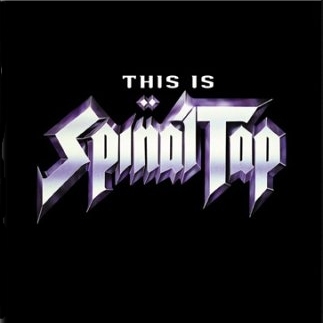 What is a spinal tap? Really, Boyd? You went to the trouble to design a whole process to extract CSF without killing the subject? Really? Wow. How ingenious of you. Was Topher in on it? You know, even as a supervised medical student (the lowest of the low, training-wise…ask any nurse in the universe), I still never killed a patient with a lumbar puncture. As a matter of fact, none of my classmates did either. Or my residents. And we did a good number of lumbar punctures during my training. The normal spinal tap procedure is perfectly adequate for life-preservation purposes. You didn’t have to design a new, overcomplicated device for the sole purpose of doing a simple bedside procedure. But thanks for your thoughtfulness. Okay. We’re going to start with that needle array. Ignore the ridiculous size of the needles; we’ll attribute that to TV-screen needs. Scroll up and take a close look at that picture at the top of the post. Where the heck do the Evil Rossum Folks think the spine is? Yes, only there. 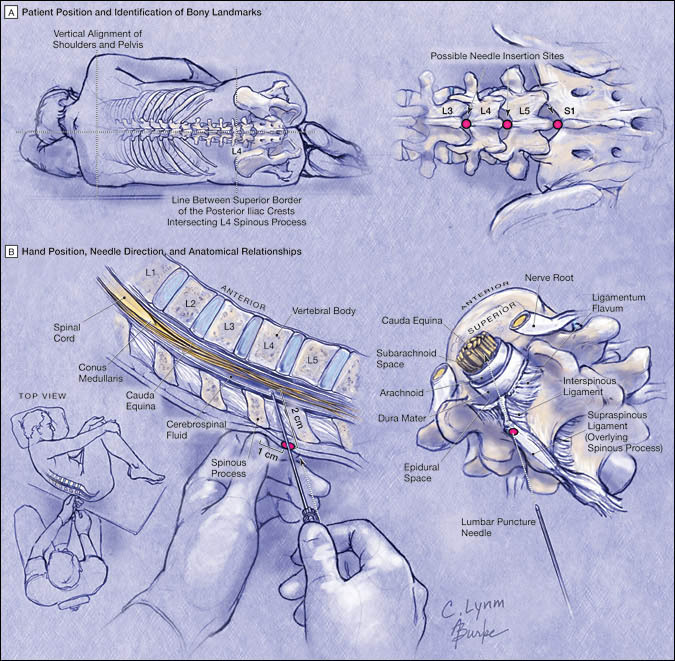 That’s the place you do a lumbar puncture: in the space between the vertebrae of the lumbar spinal column. Take a second, and put your hands on your lower back. Feel the top of your hips? Good. Move your hands to the center of your back until you feel your spine. That’s about where a lumbar puncture is supposed to happen. Too much higher and you risk hitting the spinal cord, which is the long, thin extension of nervous tissue that serves as the communication wire between the brain and the body. Actually, it’s lucky that Boyd and his Evil Rossum “doctors” have no idea where the spine is. Those needles were seriously hitting her all the way up to the level of her shoulders! Paralysis, anyone? Although, to be honest, even if the needle array was in a straight line directly beneath Echo’s spinal column, she’d probably still be all right. The needles would never get past her vertebrae. The vertebrae are the bones that protect your spinal column from injury. And what’s a spinal tap if not a carefully controlled, therapeutic injury? 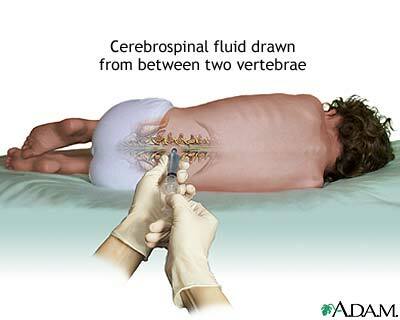 In order to get to the place where the CSF lives, you have to direct a needle BETWEEN the vertebrae of the spinal column. It’s not as easy as it might seem. And you certainly can’t do it blindly, by positioning a needle under a person and then lowering the person onto the needle. That’s just absurd. 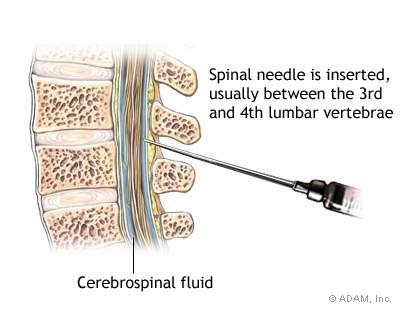 This is a picture of a needle being directed between the vertebrae of the lumbar spine. The person in the picture is facing to your left. The needle is coming in through the person’s back. That needle position would probably get to the CSF. But you’d never be able to do that to Echo, not the way she was lying on the table. Flat. On the table. I’ll show you a couple of pictures of lumbar punctures from various educational materials. See if you can catch a pattern that Echo does not follow. Every time you see a person getting the procedure done in these pictures, they’re CURLED UP. That’s because the vertebrae, in their general orientation, are really well-positioned to protect the spinal cord from any intrusion. 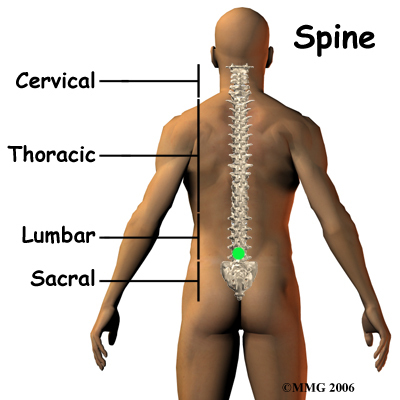 You have to change their general orientation to get any kind of access at all to the spinal cord. Usually you ask a patient to curl up on their side, or dangle their legs over the side of the bed and curl their chest to their knees. This opens up the vertebrae in the back, at least a bit. Enough to pass a needle through. Hopefully. Since Echo is flat on her back, I’d bet that the bony processes that you see to the right of the needle-position picture would block any intrusion that the needle array could possibly threaten. You know, if the needles were even positioned between the vertebrae. You know, if the needles were even positioned under the spine. The Evil Rossum “doctors” are sticking needles (supposedly) into Echo’s spinal column. To extract CSF from a space that communicates with Echo’s brain. Luckily, they’re using proper sterile technique, so she doesn’t get an infection in that very attractive-to-buggies culture medium. Oh wait. No, they aren’t. They’re wearing bunny suits and nitrile gloves. Those aren’t sterile materials. But we can forgive that; they’re cheap costumes and it’s a flipping TV show. And anyway, even I agree that it’s important to have “hands of blue” at least somewhere in your Evil Corporation. So we’ll let that one pass, because at least they’ve properly prepared the site (oh, sorry, sites) of the puncture(s), making sure the overlying skin has been cleaned so the needle doesn’t carry bacteria with it into the spinal column. Oh, wait. No, they didn’t. As a matter of fact, it even looks like several of those needles are going right through Echo’s bra-thingy. Okay. Not sterile. At all. Okay…at least they’re wearing masks and caps. I guess that’s going to have to be good enough. We all know that Joss Whedon likes to torture his characters. (And emotionally torture his audience, when he can manage it.) So of course Boyd’s Evil Rossum “doctors” aren’t going to bother with local anesthetic when they’re performing a painful procedure. But in real life, you numb the area before digging around with a needle. It’s just what you do. Okay, okay, I get it. Joss Whedon did absolutely no research on lumbar punctures for the “Hollow Men” episode, and as a result, he’s made your job harder and you’re annoyed. This post is getting really long. Boo to Joss Whedon for potentially scaring the crap out of my patients for the sake of a big, dramatic torture scene that makes no medical sense whatsoever. It’s unnecessary. Patients already have enough scary stuff to deal with. And on my end, it feeds right into the exceedingly popular “doctors-are-evil” stereotype that I have to fight every day in order to even start doing my job. Lumbar punctures are not fun for the patient, and are also not fun for the physician. But they’re not as bad as Joss Whedon wants you to think they are. So please don’t freak out if you have to get one. If you use this as if it were real medical information, I will be incredibly upset. But I still won’t lower you onto a bed of horse needles. Because that’s just silly.